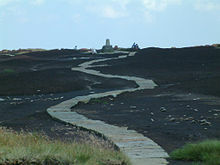 National Trails are distinguished by being maintained by the National Trails organisation. As of January 2015[update], there are sixteen such trails, one of which is not yet complete. England Coast Path, 162 km (101 miles) so far opened, eventually to cover the entire coast of England with a planned total of 4,500 km (2,796 miles). As of January 2015[update] not yet complete - expected by 2020. Great Trails formerly "Long Distance Routes" were once proposed and financially supported by Scottish Natural Heritage, but administered and maintained by the local authority areas through which they pass. With the passing of the Land Reform Act (Scotland) 2003, access rights largely no longer require to be negotiated and a further 20 Great Trails have now developed in Scotland. Annandale Way from Moffat to Newbie Barns, on the Solway Coast a distance of 55 miles (89 km). Ayrshire Coastal Path from Glenapp to Skelmorlie a distance of 100 miles (160 km). Berwickshire Coastal Path from Cockburnspath to Berwick-upon-Tweed a distance of 28 miles (45 km). Borders Abbeys Way circular route: Kelso – Jedburgh – Hawick – Selkirk – Melrose a distance of 68 miles (109 km). Cateran Trail circular route: Blairgowrie – Kirkmichael – Spittal of Glenshee – Alyth a distance of 64 miles (103 km). Clyde Walkway from Glasgow to New Lanark a distance of 40 miles (64 km). Cross Borders Drove Road from Little Vantage to Hawick a distance of 52 miles (84 km). Dava Way from Grantown-on-Spey to Forres a distance of 24 miles (39 km). Fife Coastal Path from Kincardine to Newburgh a distance of 117 miles (188 km). Formartine and Buchan Way from Dyce, near Aberdeen to Fraserburgh and Peterhead a distance of 53 miles (85 km). Forth-Clyde/Union Canal Towpath from Bowling, Dunbartonshire to Fountainbridge, Edinburgh a distance of 66 miles (106 km). Great Glen Canoe Trail from Banavie, near Fort William to Clachnaharry, near Inverness a distance of 60 miles (97 km). Great Glen Way from Fort William to Inverness a distance of 79 miles (127 km). John Muir Way from Fisherrow, near Edinburgh to Dunglass, near Cockburnspath a distance of 45 miles (72 km). Kintyre Way from Tarbert to Southend, Argyll and Bute a distance of 87 miles (140 km). Moray Coast Trail from Forres to Cullen a distance of 50 miles (80 km). Mull of Galloway Trail from Mull of Galloway to Glenapp a distance of 36 miles (58 km). River Ayr Way from Glenbuck to Ayr a distance of 44 miles (71 km). Romans and Reivers Route from Ae to Hawick a distance of 52 miles (84 km). St Cuthbert’s Way from Melrose to Lindisfarne a distance of 62 miles (100 km). Southern Upland Way from Portpatrick to Cockburnspath a distance of 212 miles (341 km). Speyside Way from Buckie to Aviemore a distance of 65 miles (105 km). Three Lochs Way from Balloch to Inveruglas a distance of 31 miles (50 km). West Highland Way from Milngavie, near Glasgow to Fort William a distance of 96 miles (154 km). West Island Way from Kilchattan Bay to Port Bannatyne a distance of 30 miles (48 km). Those included here meet the definition of a long-distance path as being around 50 km (31 miles) or more, particularly that they will take more than one day's walking to complete. Some shorter paths linking between major walks (e.g. Maelor Way) are also included. Centenary Way, Warwickshire - covers 158 km (98 miles) from Kingsbury to Upper Quinton. The Gordano round. A figure of eight route running 43.5 km (27 miles) from Portishead and via Clevedon and Abbots Leigh. Hertfordshire Way, a 312 km (194 miles) circular route around Hertfordshire parts within 20 miles of London. The Mercian Way is part of National Cycle Route 45, but is also well used by walkers. Northumberland Coast Path, from Cresswell to Berwick-upon-Tweed, part of the North Sea Trail, a 103 km (64 mi) coastal walking route. Quantock Greenway, a figure of 8 centred on Triscombe in Somerset, the northern loop is 31 km (19 mi), the southern loop 29 km (18 mi). Shakespeare's Way, 235 km (146 mi) from Shakespeare's birthplace in Stratford-Upon-Avon to the Globe Theatre on London's South Bank. The route opened on 19-April-2006. St Bega's Way, 58 km (36 mi) from St Bees Priory to St Bega's, Bassenthwaite in Cumbria. Trent Valley Way, 187 km (116 mi) from Trent Lock, Derbyshire, to Alkborough, Lincolnshire. Annandale Way Exploring the River Annan from source to sea. Ayrshire Coastal Path From Stranraer to Skelmorlie along the Ayrshire coast. Cape Wrath Trail, runs around 300 km (186 mi) from Fort William to Cape Wrath; as the route is unwaymarked, different guides to it suggest slightly different routes. See here. Clyde Walkway Meander the length of the mighty Clyde river. Several European walking routes pass through the United Kingdom. They all use sections of UK long-distance paths. The North Sea Trail covers seven countries with North Sea coastlines. ^ "Oldham Way". LDWA website. Retrieved 26 May 2012. ^ "Orange Way". LDWA website. Retrieved 26 May 2012. Wikimedia Commons has media related to Trails in the United Kingdom. This page was last modified on 10 May 2016, at 11:34.